Technical cooperation (TC) remains one of the most heavily used forms of aid, accounting for between a quarter and a half of ODA. Bilateral donors provide most of TC (although steadily declining), but multilateral organizations maintained stable funding for technical cooperation from 1.6 billion USD in 2000 to 2.2 billion USD in 2014 (in constant 2013 USD), which is equivalent to around 12% of total TC in 2014.Now that multilateral organizations committed to help in achieving the 2030 Agenda, it is now worth looking at experiences in multilateral TC and to learn from good and bad practices. This forum will bring together representatives from civil society, and from the International Monetary Fund and the World Bank to discuss how “fit for purpose” is the IMF and World Bank’s TC for achieving the goals of the 2030 Agenda. It aims to deepen the discussion on development effectiveness principles by examining the provision of TC in developing countries from the perspective of civil society. Lessons, issues and challenges in the implementation of IMF and WB’s technical cooperation for effective development will be looked into towards coming out with policy recommendations and developing partnerships to address the bottlenecks. 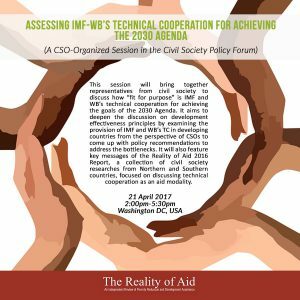 This event is a CSO-organized session in the Civil Society Policy Forum, which is part of the IMF and World Bank Spring Meeting 2017. OECD Dataset, DAC2a, April 2016. As cited in the Reality of Aid 2016 Report.